With the start of college basketball season on the horizon, we’ll be taking a long look at the conference at large as well as Indiana’s roster over the next month. Today, we look at sophomore Peter Jurkin. 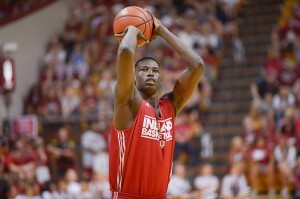 In his first season at IU, perhaps the only thing more telling about Peter Jurkin than his raw skills was his health. As someone who had battled injuries during his entire high school career, Jurkin came into his freshman year with an undisclosed foot injury, which severely limited his minutes. In fact, he had a total of seven minutes of action all season, playing in only the Florida Atlantic, Jacksonville and Penn State games after returning from a nine-game NCAA suspension. However, Jurkin didn't face much pressure coming into his freshman season to come in and play immediate minutes, especially with an All-American center ahead of him on the depth chart in Cody Zeller. Now, Zeller's gone. And heading into the 2013-2014 season, Jurkin is one of only two centers on Indiana's roster, the other being freshman Luke Fischer, who has battled injuries this preseason as well.